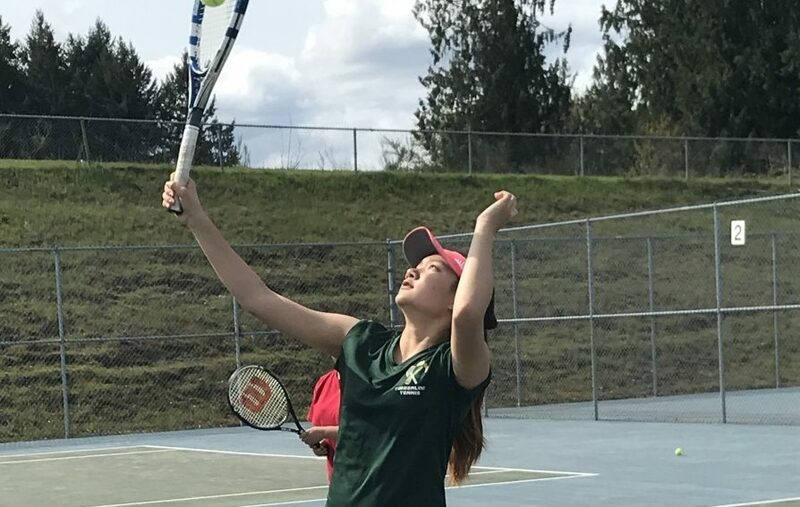 Girls tennis at Timberline High School has been ongoing for decades. With a season record of 3-5, the team continues to welcome students who have never played tennis or any sport before. 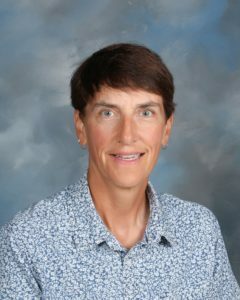 Coach Mosher has played and coached tennis at Timberline High School for seven years. To Mosher, tennis is a sport that incorporates sportsmanship, teamwork and especially integrity. In tennis, the player is responsible for calling an opponent’s ball out of bounds. Teamwork is another big focus of the team. Only two players on the entire team play singles, leaving all the other players to work together as teams of doubles in order to win their match. “Our tennis team is just a chance to be part of a team and to try a new sport. It’s a social thing,” Mosher explains. “It’s a sport that anyone could get the hang of and the girls on the team are really nice to each other. We’re like a family. It’s something you can play through college, or even after college when you get older. It’s a lot of fun,” sophomore Maya Parker says. Parker has played tennis for two years and frequently plays varsity. “I like the competitiveness and the friendships I’ve made,” says Mia Douglas, sophomore. “We’re all very determined and energetic. 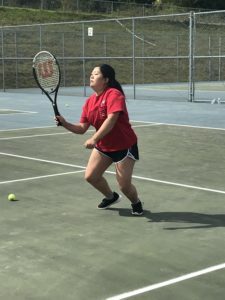 There’s a lot of high energy at practice and at matches, and everyone’s super friendly, which makes it a great environment.” This is Douglas’s first season of tennis. “You can be competitive and play in college or USTA, but you can also just play for fun,” comments Coach Mosher. Despite Washington weather, the tennis team still finds the time to practice and have matches. Last season, the precipitation in inches was about two and a half times above the average, according to the Seattle Weather Blog. Most of the matches were postponed due to weather, two of the matches were never rescheduled. Timberline only had two practices outside during last year’s tennis season. Whenever the weather is poor, tennis practice is held in the gym for about an hour, compared to two and a half hours when the weather is nice. “You can always improve, you can never play a perfect game,” says Mosher.